In the aftermath of World War I, the plebiscite, also known as a referendum, was used by the League of Nations to settle any international borders within Europe that were still in dispute. As a result, German plebescite stamps were issued to publicize and promote the plebiscites. These stamps are highly collectible, as are other issues, such as the German colonial stamps. One set was issued publicizing the Schleswig plebiscites; they were printed in January of 1920 and there were two designs used: one was the Arms of Schleswig, the other being a picturesque pastoral scene. While the stamps bear Danish legends that read “Slesvig” and “Plebiscit,” they are issued using the German Marks and Pfennig. Three zones were ultimately formed using three separate referendums. The Schleswig plebiscite was dubbed Zone I, while Zone II consisted of the center of the province. The third zone was the southern portion of the province. Zone I was primarily Danish, and easily ended up returning to Denmark when the vote took place in 1920. The other two zones ended up remaining in Germany, but Denmark ended up receiving back a great deal of the province Prussia had taken back in 1864. This was a peaceful resolution to a lengthy border dispute. When the plebiscites were finished, the same German plebescite stamps were used for Danish Zone I, but had an overprint of “1. Zone” and were printed in Danish denominations. 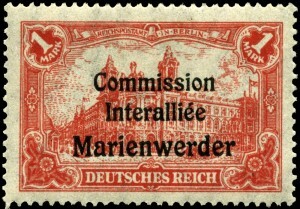 They were in use until the summer of 1920, which is when the borders were finalized and the respective Danish and German stamps replaced them. Other stamps that were issued following World War I as a result of the plebiscite proceedings were from Allenstein, Marienwerder, Oberschlesien, and Saargebiet. If you are interested in learning more about these and other stamps that are part of German history, contact Treasure Coast Stamps today.